This year in an effort to avoid the usual frenetic pace of holiday happenings, I decided to pick one special adventure and leave the others for another year. 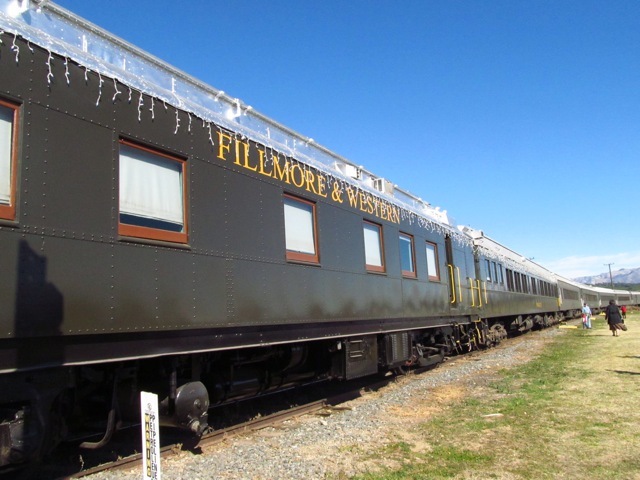 When I discovered the Christmas Tree Train ride offered through the Fillmore & Western Railway Co., I knew this was it. 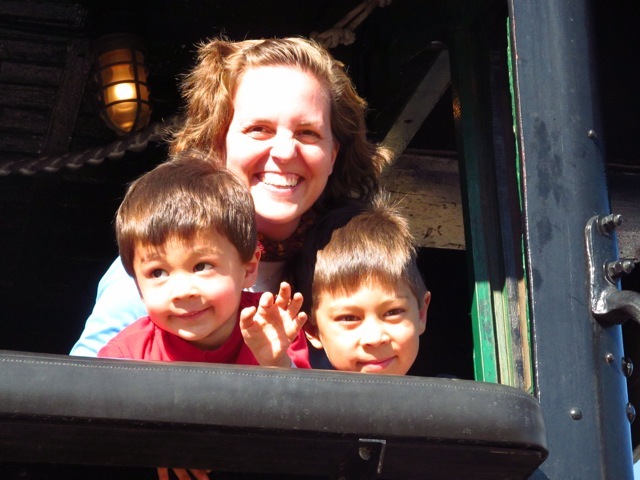 Not only do you get to ride on a real steamer (with Santa making a guest appearance! 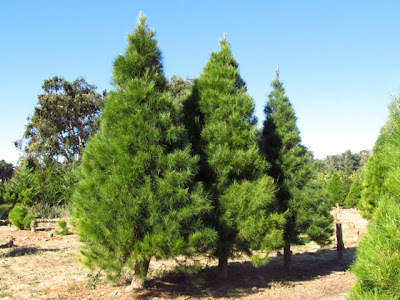 ), but the destination can’t be beat: A Christmas tree farm where you can cut down your own tree! Insider tip: Even if you have pre-purchased tickets, arrive early and expect to wait in lines for ticket pick up and boarding. 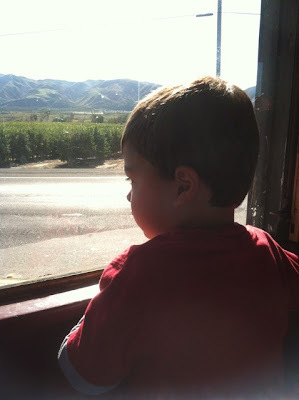 Riding on a train is pretty exciting stuff for little kids. Even so, the 30 minute-ride to the farm was just the right length for The Explorers. We had about 1.5-hours to explore the farm before we needed to be back on the train. Of course, we had no intention of cutting down a tree on this particular adventure (ours was already proudly on display at home). But there was still plenty of fun to be had. 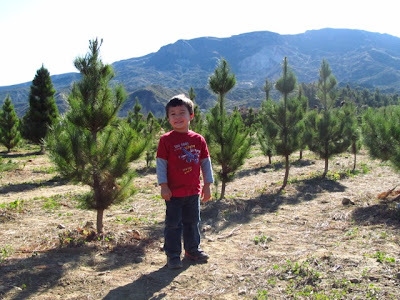 This being our first trip to a Christmas tree farm, we enjoyed just walking through the fields. 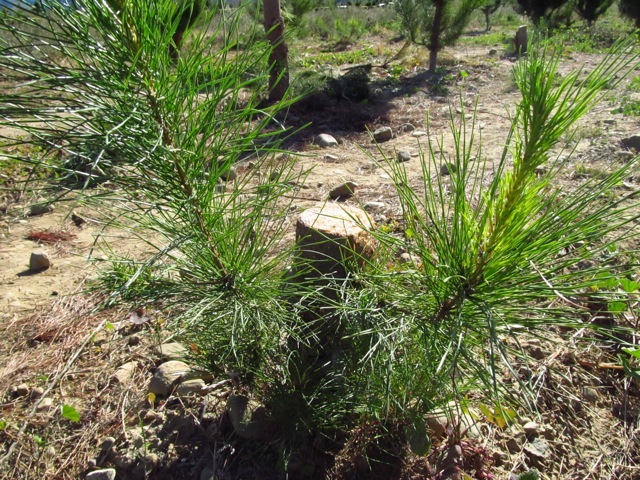 There were lots of interesting things to discover – like the stumps left behind by already picked trees. All of the trees at the Santa Paula Christmas Tree Farm are Monterey Pines, whose claim to fame is that it is the longest lasting and most fragrant tree available. We tried to imagine where huge trees like these might fit (certainly not in our house, the kids agreed). Insider tip: You don’t need to cut down your own tree to get something out of this adventure. Explore the farm, bring along a picnic & enjoy the time outside. After perusing the fields, we headed back toward the train. The kids were lucky enough to be able to hop aboard the engine for a quick look-see & photo op, then take a photo with Santa. There were lots of other for-fee activities, too – like camel and pony rides and a petting zoo. We skipped it all in favor of shaved ice and a warm, soft pretzel. Insider tip: Bring cash! The food and activities are cash-only, with no ATM in sight.